Oil, an essential ingredient in the Mediterranean diet, is the great protagonist of this route, together with the rising and falling landscape. The hills and mountains here have many legends about the feared and admired bandoleros, who used the area as the ideal place to hide out after commiting their crimes. In the area surrounding Viñuela and its reservoir and environment for enjoying Rural and Active tourism is steadily being developed. This area, as with the majority of la Axarquía, enjoys great demand among those who look for direct contact with the rural and natural environment. Important and varied towns make up this route. Periana possesses numerous archaelogical sites in its surrounding area, such as those of el Cerro Capellanía and the del Fuerte Neotithic Site. The necrópolis of Santa Ana and the remains of the Vilo Arab Baths give an idea of previous settlements here. Colmenar presided over by the Hermitage of Nuestra Señora de la Candelaria and Riogordo, and with its Parish Church of Nuestra Señora de Gracia, forms part of the history of la Axarquía. During the invasion of Napoleonic troops the so-called “Cura de Riogordo” leading one of the guerrilla squads, attacked the French troops even in their own barracks. On the sedi of the Pico de la Maroma stands Alcaucín, the current name of the village derived from the Arabic Al- Cautin. Close by is the village and castle of Zalía, built upon a Phoenician fortress. 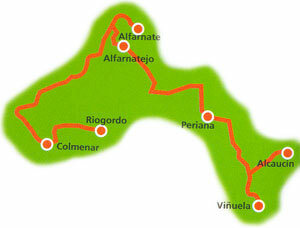 Finally, in the north of la Axarquía are situated Alfarnate and Alfarnatejo. Close to the first of these the Venta de Alfarnate which dates from 1690. A one-time scene of bandolero chases undertaken by the “Migueletes”, this roadside inn nowadys offers exquisite cuisine in a romantic setting preserved as it used to be.